New track, Bimarian, OUT NOW. Hi, since finishing with Facebook, I am releasing individual new tracks whenever I feel like it, so here’s the first. I know very few people will see this post, but thanks for subscribing if you do. Enjoy. PECHORA – New Album. OUT NOW. New Album – Pechora – OUT NOW. 10 Tracks. An album I’m very proud of. New EP – ‘Rynk’ – Out Today. Hello. My release ‘strategy’ is this: ‘Whenever the mood strikes me’. And October has brought mood. And with it, this new EP. ‘Rynk’. 6 tracks. 6 moods. Electro. Acoustic. Orchestral. Piano. Dance. Cinematic. NEW RELEASE – Stelliferous / Can You Keep My Secret? – Out Today. Hello. I have waited till Autumn to release music because I love Autumn. So here we are. If you follow me on Facebook, don’t forget to click ‘See First’ and turn on Notifications for my posts! NEW RELEASE – Saperlipopette – Out Today. From the forthcoming album ‘Koompassia’, this. A 7-minute electro/dance track in 11/8 time. As usual. 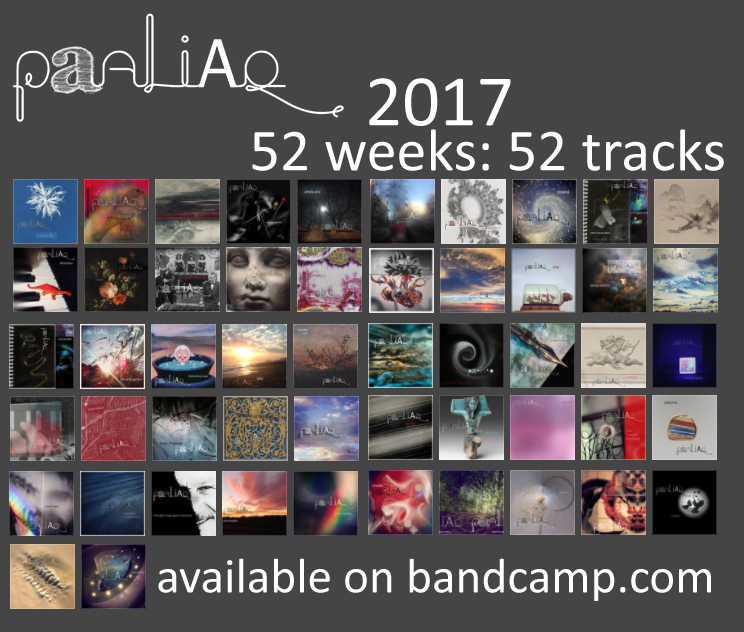 52 weeks, 52 tracks. 1 musical year. Hi. This is the last of this year’s weekly new releases. ‘A Deeper Blue’. I knew this would be ‘week 52’ some months ago. It feels like an ending song, and I love it very much. Also here is week 51 ‘With Feathers of Fire’. I hope you have enjoyed most/some/all of these tracks as much as I love making them. I’ll soon be putting out compilations gathering the second half of the year on two albums at a reduced price – alongside ‘Kinds‘ and ‘Attributes‘. Thank you for following/listening/purchasing, and I wish you a very Happy New Year. Roundup: 8 weeks, 8 New Tracks. Enjoy. ‘Cajeput Bay’ – October 24th. A soft, autumnal wheel of flickering sun, gentle, rolling beats, burnt auburn leaves, electric piano, and warm, hopeful colours. ‘Calm Is Not An Option’ – October 31st. Halloween release. Dark, strange, disturbed and spooky! An autumnal piece of gentle, wide-sky, acoustic guitar, vocal and synth reflection. From distant strings in the rain, to wavering sine waves, gentle vocals, sonorous basses and pounding, crisp n’ glitched electro drums. FREE TRACK – A dreamlike, pulsating, squeezebox, piano, vocal and oboe voyage of wonder, colour and light, or something. ‘Amelia Jinx’ – November 28th. A piece of strange, symphonic, gothic fairy tale winter darkness, with piano, orchestra and auto harp. ‘Sharp Circles’ – December 5th. Cold and fragile, piano creaking, snow falling. Catchup time – 6 weeks / 6 new tracks! Here’s the last 6 weeks in full. Enjoy. A Retrograde Round-up of Recent Releases! – 7 NEW TRACKS. Hi, hope you’re all doing well, this is a really, really late post, sorry. Time to round up my weekly releases since… July..! Including this week’s piece of gentle piano calm, Pellucid. Calm.. is something I treasure. And more guitar on this one again.